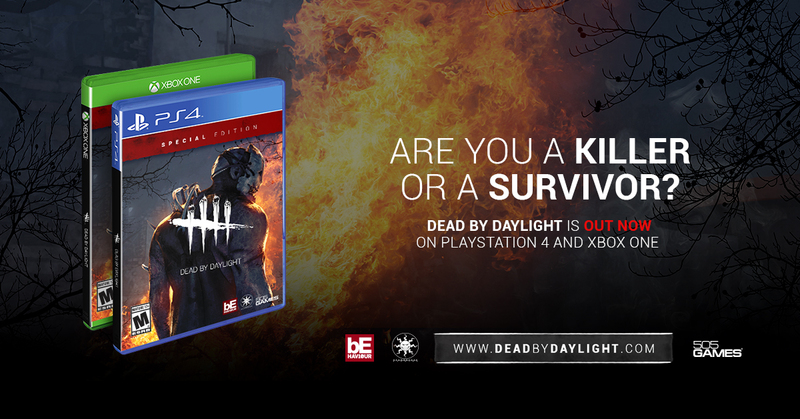 Dead by Daylight™ out now on PlayStation® 4 and XBOX One in North and South America! Stockholm, Sweden, June 20th – 2017 – The hugely successful PC game Dead by Daylight is out now in North and South America on PlayStation 4 and XBOX One, with a following release later this week for European territories including the U.K., France, Germany, Italy and Spain. Developed by Behaviour Digital and published by Starbreeze Studios, Dead by Daylight has sold over 1.8 million copies worldwide. Dead by Daylight is an asymmetrical multiplayer (4vs1) horror game that casts one savage Killer and up to four Survivors that desperately try to survive a terrifying nightmare. Survivors play in third-person with a strong situational awareness to avoid being caught, tortured and slayed. The Killer plays in first-person, focused on hunting down and killing their victims. Released on PC in June 2016, Dead by Daylight has already sold more than 1.8 million copies on the digital distribution platform Steam and became an instant favourite with streamers on Twitch and other streaming platforms. Starbreeze has set out to develop truly immersive virtual reality (VR) experiences by integrating software and hardware in its StarVR® head mounted display, produced together with Acer. Together with wholly owned subsidiary Enterspace, Starbreeze further solidifies its presence in location based entertainment. StarVR can additionally be found at IMAX VR Centres in Los Angeles and New York. Headquartered in Stockholm, Sweden, Starbreeze shares are listed on Nasdaq Stockholm First North Premier under the tickers STAR A and STAR B with the ISIN-codes SE0007158928 (A share) and SE0005992831 (B share). Remium Nordic is the company’s Certified Adviser.